Ever since Peter Fonda and Dennis Hopper set out across America to find their destinies in Easy Rider, the motorcycle and its iconic connection to rebellion and self-discovery have been firmly entrenched in films. Now, Rockstar North has brought the same sense of rule-breaking and friendships formed on the open road to Grand Theft Auto IV with the first DLC addition, The Lost and the Damned. The Lost and the Damned (LATD) had the difficult task of following up one of the highest critically rated games in 2008, and with the original game having been out nearly a year, the pressure was on all the more to make gamers remember what they liked about GTA IV, and hopefully improve upon it as well. Rather than continue the story of Niko Bellic from GTA IV, Rockstar opted to start anew with the tale of a biker, Johnny Klebitz. Johnny appeared briefly in a couple of the missions in GTA IV, but LATD is his real showcase. If Niko was a shade of grey on the morality spectrum, Johnny is likely coming from a darker place. This is a GTA game, so it isn't long before you're riding around the city inflicting pain on lowlifes and rivals, but Johnny ends up being a character you can't help but like, even in the worst of circumstances. The balance Johnny attempts to maintain in LATD is a tenuous one, and it quickly becomes threatened by the club President, Billy Grey. You're likely already familiar with and have formed an opinion on issues like graphical quality, the combat system and other gameplay features. Since LATD doesn't make big changes here, the focus of this review is largely on story and value for the cost of the DLC. I felt that the story was very strong; I genuinely was interested to see how it was going to play out and who would be left standing at the end. The voice acting is particularly well done, with memorable lines throughout and plenty of in-combat taunts. Johnny's story mixes with Niko's in often subtle ways (as well as quite overtly in one case), a real treat for the people who enjoyed GTA IV and wanted to spend a little more time with their favourite Baltic brothers. When you get right down to it, LATD is another great chapter in the story that GTA IV started. There's a certain feeling that kicks in when you're cruising around Liberty City on a piece of classic American machinery while The Doors "Five to One" plays on the radio. Add to this the camaraderie of your fellow club members, who ride in formation alongside you should you require it and you'll wonder how you ever rode around in cars. These "brothers" as Johnny often calls them are somewhat useful in a firefight, but like most games with AI buddies, you're going to have to do most of the work yourself. Thankfully, you won't have to do any of the forced-friendship building that GTA IV had, so that feeling of "I'd better call Brucie or I'm going to lose friendship points" is absent. 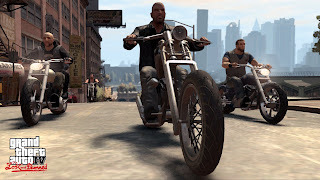 You can still do all that stuff if you like, but the real fun of the game is going to be the story missions, along with optional bike races, gang wars and random people on the street needing some nefarious deeds done. There's easily 8 hours worth of content here, and given what some $60 games are clocking in at time-wise, the price of $20 seems reasonable. More importantly, it's not 8 hours of filler or pointless content. If GTA was a hearty dinner for your gaming appetite, LATD is lunch with an old friend. Personally, I can't wait for a 3rd helping.